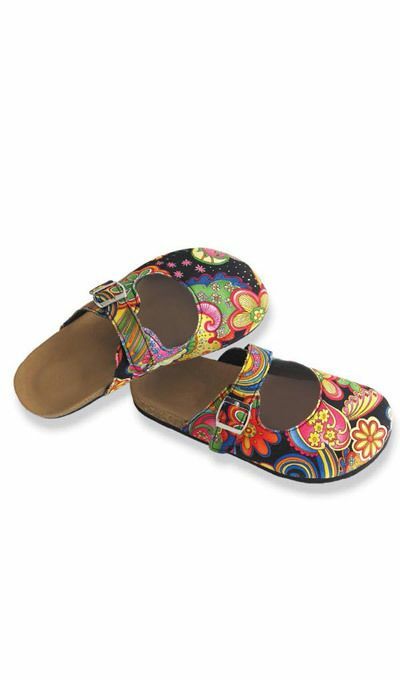 Open, airy Black Paisley Clogs in brights-on-black polyester feature a super cushy, contoured cork footbed for arch support and a deep heel cup for stability. EVA soles are lightweight, cushiony and long-wearing. Imported. Available in whole sizes. Really cute shoes...great buy! The only complaint I have is that upon opening the box, the shoes had a super strong smell that I am assuming is from the paint on the material. Otherwise, very fun shoes. They are cute and easy to slip on. Nice fit that is true to size. Colors are bright and just as pictured. Footbed is very firm and may take some getting used to as there is little cushion. I may be adding an onsole. The shoe bottoms are very slick so may not be too suitable for wearing outside. I like them but probably would not have bought them if I had seen them in a store. A comfy and easy slip on shoe. Love to wear. "Since I've been wearing these, I've had a zillion compliments & 3 family members have asked me to order a pair for them!"